I had a fun weekend, how about you? First of all, the weather was terrific. Hot but not too humid with abundant sunshine. I love summer and these long warm days are a big part of why I enjoy it so much. On Friday I had Jack all day and it was great. Dale and I took him with us to the bench dedication that was part of our family being honored last November. It was such fun to show him off and he behaved perfectly. 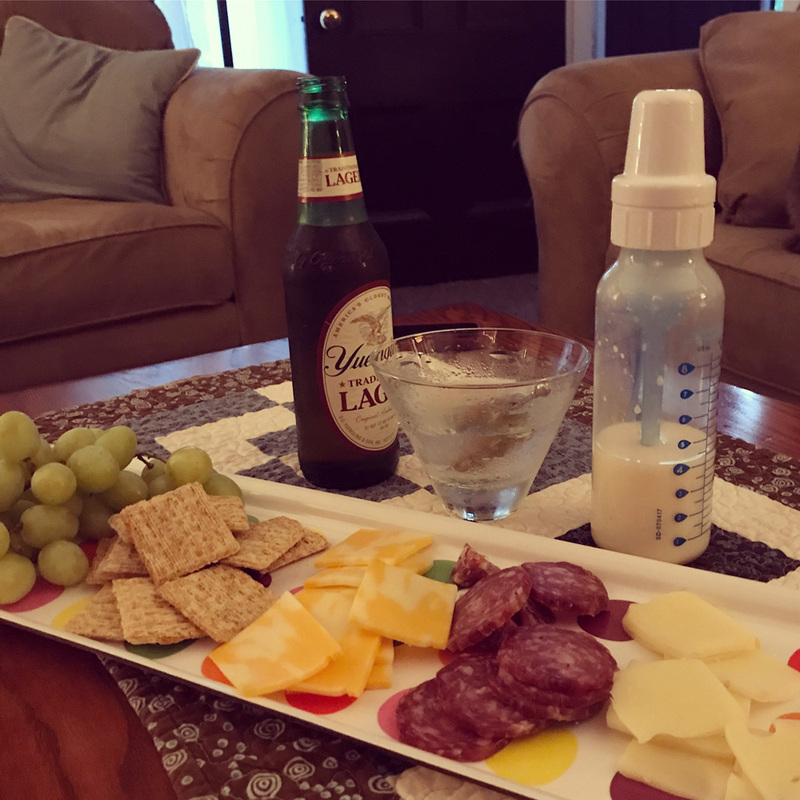 We came home and had Friday Night Snacks . . . with a slight modification. On Saturday we had a full day at home, doing yard work and catching up on the general stuff of life. We spontaneously invited Sean over for dinner and enjoyed some snacks and cocktails on the deck first. 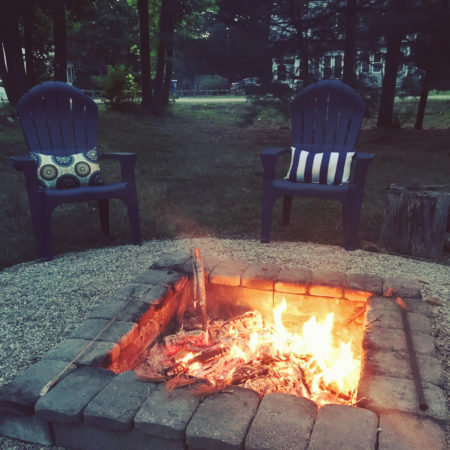 After dinner we had a fire and I posted this photo on Facebook mentioning that we had empty chairs if anyone wanted to come over. Next thing I knew we had 2 couples join us – good friends who we don’t hang out with nearly often enough. It was totally spontaneous and a really fun evening. Sunday was Father’s Day so the kids came over. Jack, of course, was a big hit and I think he likes the new sunglasses I got him! We hung out all afternoon, drinking sangria and eating chicken wings and burgers. It was low key and perfect and just a great way to end the weekend. 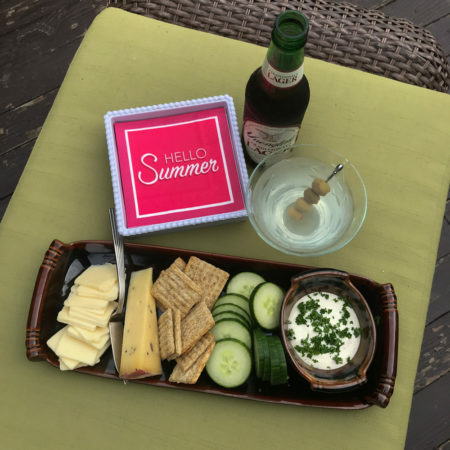 You’ve perfected the art of enjoying summer on the deck; I do wish I lived closer! You don’t know how much Tom and I wanted to fill your empty chairs . 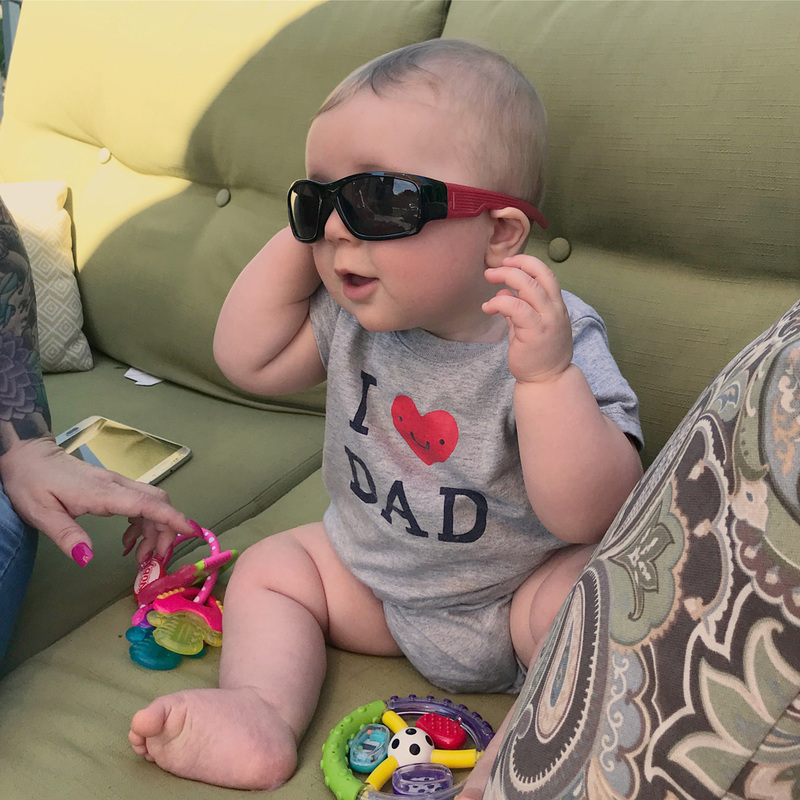 . .
Little Jack in those sunglasses. Oh.My.Goodness. I wish it was nice enough to have enjoyed some outdoor time on my patio, but we are in a miserable heat wave. I go out and tend to my garden at 5:30am and then spend the rest of the day indoors…it is only June, but it is brutal out there! What a wonderful weekend it was! And that Jack! Keep him coming! Keep enjoying that good weather. I think the heat wave we have been having is heading your way. It sounds like another great weekend at Carole and Dale’s to me. If only I lived closer, I would have run over and jumped into one of those chairs. Jack. Those sunglasses. Such a cool little dude! Have a fabulous week, Carole. You and Dale (and now Jack) are the kind of people who are just plain magnetic! I got a new puppy a week ago, so I spent allot of time walking in circles around my driveway, trying to get her to potty! (She is only eight weeks old, so it is very early days as far as housetraining is concerned.) I took a quilting class Saturday morning, and had dinner at my parents’ house Sunday evening. It has been crazy-humid and hot here in Iowa, so it’s been perfect weather to declutter the basement, sew, and knit socks. Jack looks pretty cool in those sunglasses. Since our kids are miles away, we enjoyed a quiet weekend with early walks to avoid the oppressive heat. We did go see the documentary RGB about Ruth Bader Ginsburg. It was fabulous. Your Friday snacks look really good! Jack is just as cute as he can be! I’m also running after an eight week old, but I’m very luck as he is already house broken! Hope your week is a grand one!